Our family loves hot dips. 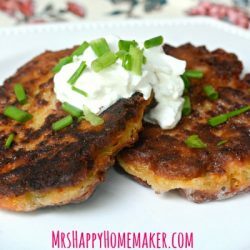 I make them as a side dish all the time, and they are always devoured. If there happens to be any leftover, they are great to heat up the next day for a snack. I’ve shared my Jalapeno Popper Dip before, & while that one remains my absolute favorite, this Spinach Artichoke Dip is nipping at it’s heels. 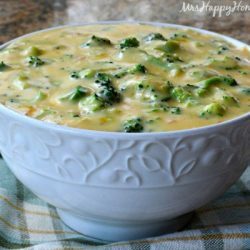 It’s so creamy & flavorful…..and it’s a great way to sneak some veggies into your husband’s kid’s diets too. Drain the liquid off of the artichoke hearts, & give them a quick chop. Cook the spinach in the microwave via the cooking instructions, subtracting about a minute. Squeeze out the excess liquid either by hand, or by putting the spinach in a colander & pressing down using a spoon or your fingers. Combine all your ingredients, except for 1/4 cup of mozzarella cheese, & place in a 2 quart baking dish. (Or if you’re like me, mix them all together in your baking dish). Bake at 350 for 30 minutes. Remove, & sprinkle on the reserved 1/4 cup of mozzarella cheese. Put the dip back in the oven for a couple of minutes to melt the cheese on top. Cook the frozen spinach in the microwave per the package instructions, subtracting a minute from the total cook time. Squeeze off the liquid from the spinach either by hand, or by placing it in a colander & pressing it down with a spoon or your fingers. In an 2 quart baking dish, combine all your ingredients – reserving ¼ cup of mozzarella cheese. Bake in the preheated oven 30 minutes, or until cheeses are melted and bubbly. Remove, & sprinkle on remaining ¼ cup of cheese. Put it back in the oven for a couple of minutes for the cheese to melt. Serve warm. 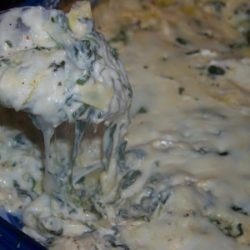 I have had spinach artichoke dips, but never with alfredo, and since I love alfredo, this looks amazing! Gonna have to make this for an upcoming get together! I love Alfredo on anything! I need to come up with an event to bring this too or I will eat the entire thing!